KOPERNIK’S SUDENTS ONCE AGAIN THE BEST! On 28th March there was an English Contest for the Best English Essay awards ceremony which took place in Academic High School in Częstochowa. The task for participants was to write an essay in one of the following topics: My favourite teacher or My role model in life. • Agata Ujma from Ig has been awarded with the Second Prize. Marcin wrote a composition about his grandfather as his idol and Agata wrote about her Polish teacher in Junior High School. Don’t be misled by “easy-looking” topics! The students put in a lot of effort as well as their heart and they revealed some facts from their private life, too. You can read both essays in attachments. We are very happy about our school’s run of good luck in latest English competitions. Students also want to thank very much their English teacher Marzena Kossak-Wąchała for all the help and support from her. After the first round held on 23 February , now it was the time for the final round in A History-Language Competition, First Edition. Five of our students, who were the best ones in the first round represented Kopernik High School. It was a stressful experience, no doubt. They had to answer the questions and do all the tasks in public, as some of the first and second year students were observing them. The main theme of the competition was the history of The United Kingdom (from the XVIII century till now) and The USA (the whole history). The questions and different tasks were both in Polish and English, so were the students’ answers. They concerned historical events, vocabulary connected with history, the main figures from history of both English speaking countries as well as text interpretation. There was also a play-off at the end, as it was hard for the jury to make final decision. All of our representatives ( including Natalia Poniatowska and Łukasz Putowski, both from 2f) did everything to do well in the competition and they all were rewarded by the organizers. DON’T FORGET – TODAY IS ST PATRICK’S DAY !!! Nobody would be surprised today when he sees many people with a bunch of shamrock in their label today! Today is a very special day all over the world for those with Irish origins. 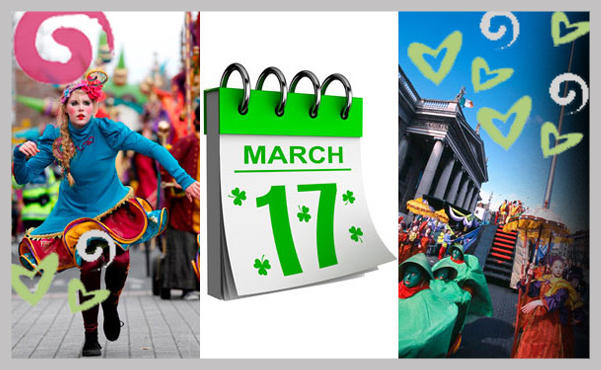 The colourful parades always include live traditional Irish music, marching bands and colourful floats full of dancers and schoolchildren dancing jigs. There is much waving of the Irish Tricolour flags, while shamrock and harp symbols are in abundance. The huge dogs taking part in the parades are Irish Wolfhounds, the world’s largest breed of dog, known as “the gentle giant”. Ireland is known as the country of “ CÉAD MÎLE FAILTE” or “A hundred thousand welcomes”. A warm welcome is always guaranteed and everybody is invited to join in the fun. The Irish see themselves as one large family and on St Patrick’s Day everyone can become part of it. DON’T MISS THE CHANCE ! BE IRISH FOR A DAY ! From 4th to 9th march 2012, our school took part in Comenius Pupils Exchange. This year we welcomed and entertained students from Spain, Belgium, French Guiana and Greece. During the workshops, each group presented simple expressions in their own language ( ways of welcoming, greetings, ways to say good bye etc.) and taught all the participants. What is more, we got to know Easter and Carnival traditions from individual countries. That’s why we were painting eggs, creating Spanish masks and searching chocolate eggs, which origins are traced back to Belgium. We also got to know delicious Greek cuisine better. Thanks to these activities we got closer to ours visitors and overcame differences between eastern and western culture. During the trip to The Beskidy Mountains foreigners found out about Polish culture, traditions and so on. They even tried to ram butter on their own and comb sheep’s wool and took part in “oczepiny” – polish wedding tradition. Later, there were some other workshops and the significant part was played by our students, who led the workshops with English teachers. We had the conversation about the way, that different countries are perceived by us. We talked about the stereotypes of different nationalities and the ways of overcoming those differences as well as fighting with the ones which are not fair. Last but not least, appeared the basketball game, which was won by the visitors. Congratulations ! It is always hard to say goodbye. The same was this time. To sum up, it is significant to mention, that it was worth taking part in Comenius for all of those people, amusing situations and experiences that will stay in ours memory for a long time. We have the pleasure to inform you about the results of the First Round of the History-Language Competition organised by I LO Słowacki High School. Among 15 students, who took part and wrote the test on 23rd February, 5 got to the Second Round. Tomorrow everything will be clear, as from 9 a.m. all the participants will be answering questions asked by the jury ( oral form). We wish all our students success! On 28th Fabruary in our school took place an annual English competition FOX 2012. 10 of our students took part. We are all looking forward to the results! That’s the third time we took part in a competition , called English High Flier.